Nope (though, otherwise, I thought Stephens made a good point about contemporary R’s prowess in ginning up anger and winning elections, only to reveal deep incompetence and non-representativeness re governance). Stephens was misled by the 3.1% real GDP growth rate in the last quarter (2017q2). But that’s an annualized, quarterly growth rate. Such measures are noisy and volatile. In q1 by that metric, GDP went up only 1.2%, but if conservative pundits raised an eyebrow over that number, I missed it. For a clearer signal of the underlying trend, it’s better to use the year-over-year numbers (see figure below). For the last three quarters, those values have been 1.8, 2.0, and 2.2 percent. 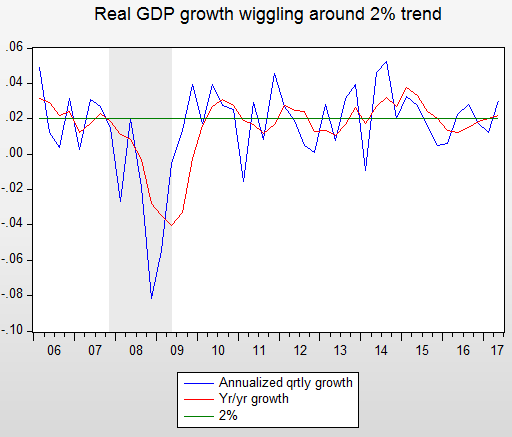 So, perhaps a bit of acceleration, but nothing that alters this conclusion: real GDP is flitting about the 2% trend in the figure. I don’t expect the punditry to have Ph.D.s in statistics, but everyone who writes in this area should know not to declare victory (or defeat) over one period’s noisy measure. Share the post "Real GDP’s still growing at ~2% on trend"
7 comments in reply to "Real GDP’s still growing at ~2% on trend"
Then come the decade driven upward revisions. GDP is meant to come in to low for the first 10-20 years. That was a Truman era ploy for post-Presidential uplifting. My bet is GDP has been growing at 2.5% in a 2% trend. That would explain a lot. The fact we are beginning 4th quarter fiscals for business will be huge again. The Bret Stephens 3 percent statement raised my eyebrows. Thanks for fitting the noise out of the data. Does using CPI to adjust nominal to real GDP growth rate understate GDP growthwages?? GDP is not deflated with the CPI. They use a specific GDP deflator, which itself is the combination of various different deflators applied to the components of GDP (consumption, investment, etc.). I don’t think wage growth is understated by inflation, as I’ve written in various places. Bret Stephens is just a reliably very conservative Op/Ed writer. His point about being able to win elections but being lousy at governance has been made previously many times by many writers. Stephens is a climate change denier; he routinely lies and makes outrageous strawman arguments and so is no different than most of his conservative peers. I have a personal policy that I’m trying to implement, especially in TV debates, where I try to find something agreeable to say about my opponent’s rap, some area of even partial agreement. Not always easy, for sure, but a worthy challenge, I think. We are way below trend and there has been massive macro failure. Why be dishonest about this? Just to argue against Republicans and their tax cuts? The public doesn’t care about the details.